During WWI, the Germans had a real advantage over their enemies, Britain and the United States. They had perfected the use of submarines from which they could launch torpedoes, making their enemies ships literal sitting ducks. Britain was especially desperate to find a solution to the sinking of ships, both military and non-military, since, as an island, they relied on boats to bring them much of what they needed, especially food, and so far, nothing has worked. That is, until Norman Wilkinson, a lieutenant-commander in the Royal Naval Volunteer Reserve, came up with an unlikely idea - camouflage the ships. But how do you camouflage a huge ship? Wilkinson knew you couldn’t make a ship invisible, but they could be painted so that they confused submarine officers trying to figure out which way and how fast the ship in their sights was traveling. 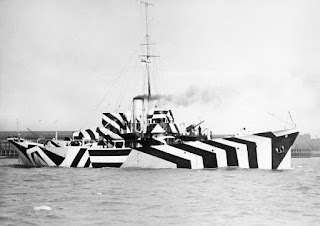 The idea of camouflage was nothing knew, but Wilkinson suggested painting a crazy pattern on one side of a ship and another crazy pattern on the other side. The patterns used were called dazzle and amazingly enough, it seemed to work. Pretty soon, two dozen women artists were creating dazzle patterns that were then applied to ships by painters and artists working together. 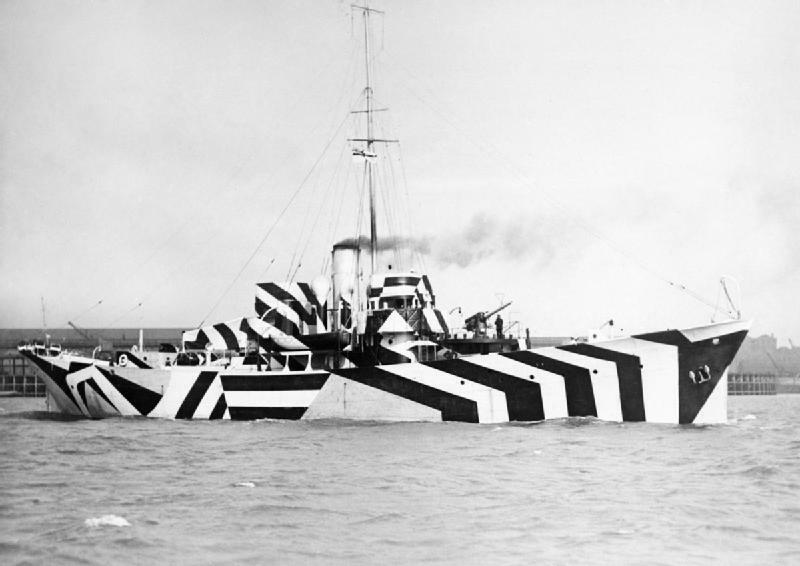 Did dazzle camouflage save any ships from being torpedoed? The British painted 3,000 ships, the Americans painted 1,000, but in fact, there may have been too many other factors making it hard to determine how effective the dazzle ships really were. In this well-written chronicle about the Dazzle Ships of WWI, readers will be intrigued that such a far-fetched idea was accepted and carried out (even the King of England was dazzled by the ships). 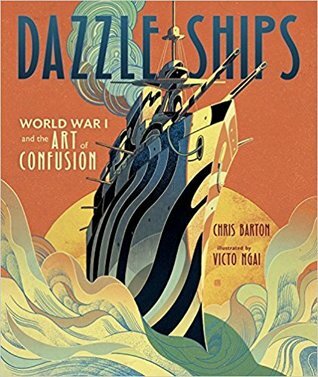 Barton’s text is enhanced and supported by Victo Ngai’s dynamic analog and digital media illustrations, which reflect not just the patterns of the dazzle ships but are rendered in the style and colors of the early 20th century, especially the art movement known as cubism. Dazzle Ships is a picture book for older readers is sure to appeal to anyone interested in the history of WWI and no doubt they will find this creative problem solving to a serious problem both fascinating and inspirational. A WWI timeline is included that shows just how dazzle ships fit into the events of the war. And be sure to read the Author’s Note and the Illustrator’s Note for more information. FYI: Author Chris Barton has contributed a very informative guest post at The Lerner Blog in which he writes about why he wrote Dazzle Ships. Mari’s Hope is the third book in the Odin’s Promise Trilogy. In the first book, In Odin’s Promise, Mari is only 11 when the Nazi’s invade her beloved Norway on April 9, 1941. Life as she knew changes overnight, and slowly, she learns that the Norwegians in her village and all over Norway are not taking the invasion and occupying German solders lying down - an active and successful resistance springs up almost immediately and by the end of the novel, after suffering a heartbreaking loss, Mari herself is part of the resistance. Book Two, Bjorn’s Gift, begins in August 1941. When German officers move into their home, Mari's family move in with her grandmother in order to continue their resistance work, even risking sheltering refugees in the attic. Bjorn is away, now a full time part of the resistance, and Mari decides to secretly record everything that is happening at home for him to read after the war. Mari is also disappointed when she learns her old friend Leif and his family seem to have become collaborators. Mari’s Hope begins in February 1943. Mari is now 14 years old and while still part of the resistance, she has also become a highly regarded assistant to Dr. Olsen, often visiting the sick in their isolated homes spread out on the mountainside around her village of Ytre Arna. Food, fuel to heat homes, and a shortage of medical supplies have caused major problems for the folks who refuse to help the Nazis, including Mari’s family. Mari is also able to travel to Bergen, to visit her sister Lise, a nurse, and to take her examinations to become a health aide. There, she meets Hanna, a smart, lively, not easily scared 8 year-old, and her friend Rolf, 14. But on her second meeting with Rolf, Mari and Hanna find him suffering serious injuries after some Norwegian Hitler Youth beat him up, and Mari ends up performing resistance tasks for him in Bergen before returning home. Mari soon finds herself traveling again to Bergen. This time it is to try to get some needed medical supplies, using a clever ruse concocted by Dr. Olsen and a friend of his in Bergen. She goes a third time to Bergen to try to help out after a harbor explosion destroys much of the area in April 1944, and to find Hanna and her older sister Julia, fearing that they may have perished in the intense fires. At home, Mari is still having difficulties with her old friend Leif and his collaboration with the Nazis, and of course, there is still the despised German officer Klein, whom Mari had nicknamed Goatman in Odin’s Promise, an alcoholic who is known for his excellent ability to trace illegal radios, one of which is owned by Mari's family. Brehl’s realistic depiction of life under the Nazis, of the way spontaneous resistance groups formed, of the fears, the deprivations, and even some of the happy times is probably the strongest appeal the Odin’s Promise Trilogy has for me. Authenticity in historical fiction is important, and I felt that Brehl had really nailed it, and yes, the terrible explosion in Bergen really did happen. One of the other things I really liked about each book in the Trilogy is the consistent message that each of us can make a difference under difficult circumstances if we work together, and Mari’s family is the perfect example of that idea. Resistance is a theme that really means a lot to me and I found the large and small acts in Odin’s Promise, Bjorn’s Gift, and Mari’s Hope gave me some hope that something as odious as the Third Reich can be overcome. Mari’s Hope takes the reader up to and just beyond the end of the war, and while there is some heartbreak in this novel, there are some nice surprises as well. And Brehl ties things up with a satisfying conclusion so there are no hanging ends. 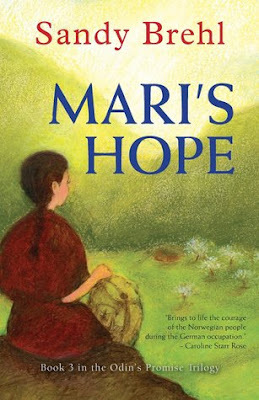 Much to her credit for creating such appealing, realistic characters, I did find that I was somewhat sad to close the book at the end of Mari’s Hope after traveling along on her wartime journey these past few years. The Odin’s Promise Trilogy are three books that will appeal to anyone interested in WWII, the Norwegian resistance, and themes about family, friends, and life on the home-front in a war. About the Author: Sandy Brehl is the award-winning author of a Norway historical trilogy for ages ten-thru-adult. 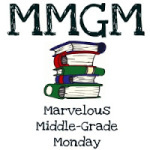 (ODIN’S PROMISE, BJORN’S GIFT, and MARI’S HOPE) She also writes a blog about picture books (http://Unpackingpicturebookpower.blogspot.com) and contributes to a blog about historical works from middle grade readers (https://thestoriedpast.org). She’s an active member and volunteer with SCBWI-Wisconsin. Sandy writes fiction, nonfiction, and poetry for young readers of any age. A retired educator living in the Milwaukee area, Sandy offers programs for schools, libraries, and adult groups. It’s the summer of 1940 and Peggy, 16, younger brother Ernest, 11, and their mum have moved in with Uncle Fred and Aunt Myra, sheep farmers in Romney Marsh on the Kentish coast not far from the English Channel. Their father is gone, and Ernest thinks he is fighting in the war, but Peggy seems to know something more about where he is and so do the townspeople, who threat them with some amount of disdain. Ernest is a bit of a neurotic boy, and like many, he's afraid that the Germans are going to invade any minute. He has gotten hold of the leaflet “If the Invader Comes…” issued by the War Office, which, rather than shoring up his courage, only makes Ernest more fearful. Out riding his bike one day, Ernest sees a plane catch fire and crash land. When he reports it, as per the leaflet, everyone assumes it was a German plane that was swallowed by the marsh along with the pilot. But during the night, Peggy wakes up and discovers the injured pilot hiding by the henhouse. It turns out the pilot, Henryk, is a Polish refugee who is flying with the RAF. Peggy decides to hide him in an abandoned church, and brings his clean clothes that belonged to her father, and some food. Henryk doesn’t want to return to the RAF, he has lost is love of flying, and has decided he just can’t fight anymore. As his story unfolds, Peggy learns about his escape from Poland after the Germans invaded, his travels to other countries to fight, and the loss of his family, including the tragic death of his three younger sisters. Ever vigilant for invading Germans, Ernest eventually finds out about Henryk. As he gets to know him, he’s really torn - wanting to like Henryk but disturbed by what he believes to be Henryk’s LMF or Lack of Moral Fiber. Ernest has been bullied ever since arriving in Romney Marsh and worries about his own LMF. In his need to prove his courage, Ernest’s wavering leads to all kind of dangerous complications for Peggy and Henryk, who meanwhile are finding themselves attracted to each other. That Burning Summer is told from the alternating points of view of Peggy, Henryk, and Ernest. It begins with a copy of the leaflet from the War Office, and each of the seven chapter begins with the instructions of what to do in case of an invasion, instructions that are reflected in Ernest’s struggles with his fears of an invasion, his own possible lack of courage, and later with his feelings about Henryk. I though Syson did a masterful job of weaving each instruction into the unfolding of Ernest's story without making it sound forced. But this is really Peggy’s coming of age story. Unlike her friend, Peggy doesn't really have feelings about boys, and certainly not about her own sexuality. Readers watch as she discovers her developing feelings for Henryk, and becomes aware of her budding sexuality. Besides the coming of age theme That Burning Summer also explores ideas of courage, cowardice, family, and loyalty in all her characters. It is not a well-known fact that many Polish pilots flew for the RAF after their country was invaded and Syson brings how it came about nicely as Henryk's story unfolds. In addition, Syson includes interesting everyday details about wartime life in a small village, and a sub-story about where Peggy and Ernest’s father really is and why, along with a mystery as to who is sending cruel notes to their Mum. Another sub-story concerns an opportunistic bully who seems to know just how to get under Ernest’s skin, adding realism and depth to the novel. The novel really only covers the events of the summer and early fall of 1940, but there is also an epilogue set in 1946 that brings readers up-to-date with Peggy and Henryk's fate. 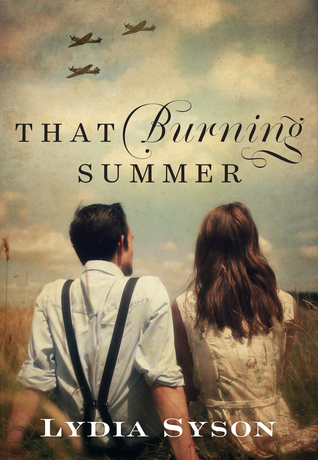 That Burning Summer is a historical fiction novel that should appeal to readers who are interested in WWII, and especially those who also like a touch of romance. When last we left Maggie Hope, her college friend Sarah Sanderson and her old boyfriend Hugh Thompson, both now Special Operations Executive (SOE) agents, were preparing to go to France to work undercover, while Maggie was excitedly expecting her newly discovered half sister, Elise Hess, to arrive in London from Germany. 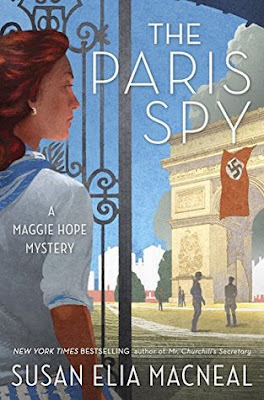 It is now June 1942 when The Paris Spy opens and France has be under German occupation since June 1940 and the Nazis have quite comfortably ensconced themselves in Paris, enjoying the finer things the city has to offer. Sarah and Hugh, code named Sabine Severin and Hubert Taillier respectively, have also arrived in Paris, she as a dancer, he as a cellist to work undercover as part of a Paris ballet company. Their assignment is to collect a bag of sand sample SOE agent Erica Calvert had collected from the beaches of Normandy, France, in preparation for the proposed invasion and it is imperative that those sample not get into the hands of the Nazis. Maggie has also arrived in Paris hoping for discover what happened to her half sister. Elise never showed up in London, as planned. More importantly, however, she is there to try to discover what happened to SOE agent Erica Calvert - is she dead? Alive? Compromised? Her radio transmittals have been coming through to England but without the required security check. And what about her sand samples? After months of waiting in the home of two resistance workers, Maggie has finally received her forged identity papers, becoming Paige Kelly from Ireland, in Paris to shop for her trousseau. Ireland was neutral during the war and so Maggie is free to move around as she pleases. She immediately checks into the Hôtel Ritz, now headquarters for the German Luftwaffe, and home to designer Coco Chanel, who in reality did live there for 37 years, including the war years, and who immediately befriends Maggie, who just happens to be wearing a Chanel suit when they meet. And to add to the danger of simply operating in an occupied area, the Nazis seem to know exactly who the SOE agents are and what they are doing in France, which can only mean one thing - there is a mole in SOE. But who can it be? And will Maggie find out before all the SOE agents’ lives are put in jepardy? There is a lot going on inThe Paris Spy. There’s mystery and intrigue mixed with the really odd glamour that was Paris after the Nazis arrived. MacNeal has really captured the two sides of the German officers who were running operations there. On the surface, they demanded the finer things associated with France - lots of champagne, the finest foods, and the best accommodations. Below the surface, the level of physical and mental cruelty is stunning. I personally felt this was a particularly interesting novel. 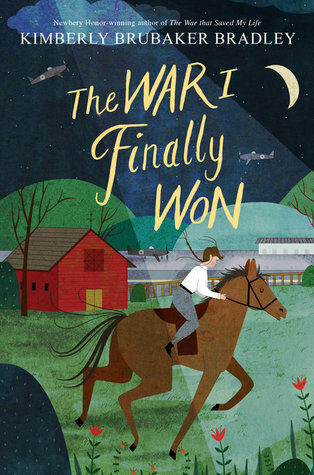 Although Maggie has rubbed shoulders with all kinds of big players from WWII - from the Queen and Winston Churchill to President and Mrs. Roosevelt, among others - I felt like this was a more thought provoking story and not just a good historical fiction mystery. Not because Maggie, Sarah, or Hugh have changed, but there was more of an insider’s look into how and why things were done and events that unfolded in it. The Paris Spy is sure to please fans of Maggie and, aside from maybe not totally understanding how Elise Hess comes into the picture, it can be read as a stand alone historical fiction novel, not just as part of a mystery series. Born in Oakland, California in 1919, Fred Korematsu was a young Japanese American who wanted more out of life than working in his parents nursery growing roses. He had been a boy scout, had a bit of a mischievous streak, ran track and played tennis in high school, and loved to dance to the jazz music of Benny Goodman and Duke Ellington. At twenty-two, he had a girlfriend named Ida, an Italian American girl whom he had to date secretly - both of their parents disapproved of them as a couple. Fred took a job building ships to save for a snazzy Pontiac, and planned on marrying Ida (despite family objections). But on December 7, 1941, the Japanese attacked Pearl Harbor and Fred’s life turned upside down. But after President Roosevelt sign Executive Order 9066 which forced all Japanese and Japanese Americans into internment camps, Fred decides to defy the order. 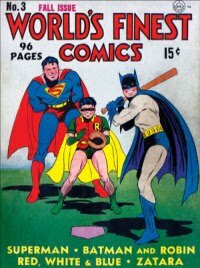 Claiming he is Spanish and Hawaiian, Fred gets away with his ruse for a while, but eventually the authorities find and arrest him. Fred’s arrest leads to a friendship with ACLU lawyer Ernest Besig, who represents him in court, believing that the internment of Japanese Americans is wrong and a violation of their rights. Meanwhile, Fred finds himself living in a horse stall at Tanforan race track. Sadly, no one at Tanforan is proud or supportive of Fred’s stand against Executive Order 9066, not even his family. Eventually, Fred is sent to an internment camp in the middle of nowhere in Topaz, Utah. Ernest Besig is still working on his case, but ultimately even the United States Supreme Court agrees with the President that it is a “military necessity” to intern the country’s Japanese Americans. While he lost his case in 1944, and believed that was the end of it, little could Fred imagine that his simple act of defiance would ultimately resurface many years later, after evidence of government misconduct is discovered in relation to the internment of so many Japanese Americans and the loss of everything they loved and had worked so hard for. In 1983, Fred finds himself back in court when his case is reopened. This time, Fred wins and that win leads to the passage of the Civil Liberties Act of 1988, which grants reparations to the Japanese Americans interned during WWII. Fred Korematsu Speaks Up is a fascinating book, and part of what makes it so engaging is that it is told using various means. Each important aspect of Fred’s personal story is related at the beginning of every chapter in free verse. This gives the reader a more intimate picture, accompanied by Houlette’s simple but affective illustrations, of who Fred really was and what he was up against, as well as his reasons for defying an Executive Order. Fred’s story is followed by factual information pertinent to what has proceeded it, the national events that impacted his life. Each of these pages contains definitions, and a timeline, as well as plenty of photos that also illustration the information presented. 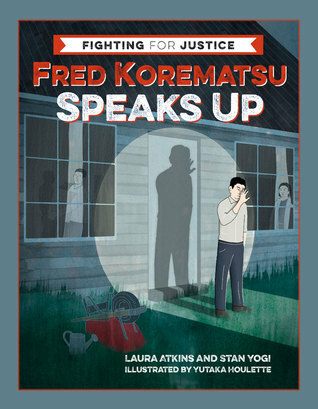 Fred Korematsu Speaks Up is the first book in the new Fighting for Justice series, and it is a truely excellent book for introducing young readers to this shameful aspect of WWII on the home front. Back matter includes Source Notes, Bibliography, a personal reflection by Fred’s daughter Karen Korematsu about her father, and a section on “Speaking Up for Justice: From Fred’s Day to Ours: with suggestions for what young people can do in today’s world, a world that is seeing a resurgent of the kind of thinking that put people into internment camps in the first place. A word about Fred’s name: his parents named him Toyosaburo, but his 1st grade teacher couldn’t or wouldn’t learn to pronounce it, and suggested Fred, instead. I wonder how that made him feel. If you have ever really wondered whether one person can make a difference in the world, Fred Korematsu’s story will definitely be one that will reassure and inspire you.